The relief includes three scenes. The first depicts Hapi (water and fertility god) with offerings, the second Osiris (god of transition) and Isis (magical goddess of health and wisdom) before an offering table, and the third shows Isis and Osiris before an offering table. Destination Egypt, a transcontinental country situated in northeastern Africa and on the Sinai Peninsula in Western Asia (Middle East). The country has a coastline at the Mediterranean Sea in north, and the Gulf of Suez and the Red Sea in east. It is bordered by Libya in west, the Palestinian territory (Gaza Strip) and Israel in north east, and Sudan in south. Egypt shares maritime borders with Cyprus, Greece, Jordan, Saudi Arabia, and Turkey. Modern Egypt became independent in 1922. From 1958 until 1961 Egypt was united with Syria as the United Arab Republic. The Arab Republic of Egypt (the official name) covers an area of 1 million km², this is almost twice the size of France or more than twice the size of the U.S. State of California. Due to its large desert regions, the country's population is concentrated along the alluvial plains of the Nile Valley and Delta and along its coasts, only about 3% of the territory is inhabited. Egypt has a population of approximately 92.4 million inhabitants (2017). Capital and largest city is Cairo. Spoken language are modern Standard Arabic, colloquial language is the Egyptian-Arabic dialect. Egypt is a country with a predominantly Muslim population, about 87% of Egyptians are Sunni Muslim. Islam religion controls many aspects of social life and is endorsed by law. In about 3100 B.C., Egypt was united under a ruler known as Mena, or Menes, who inaugurated the 30 pharaonic dynasties into which Egypt's ancient history is divided -- the Old and the Middle Kingdoms and the New Empire. The pyramids at Giza (near Cairo), which were built in the fourth dynasty, testify the power of the pharaonic religion and state. 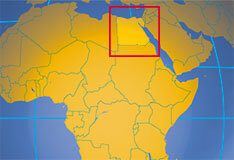 Egypt is the most populous country in the Arab world. Nominally independent from the UK in 1922, Egypt acquired full sovereignty following World War II. The completion of the Aswan High Dam in 1971 and the resultant Lake Nasser have altered the time-honored place of the Nile river in the agriculture and ecology of Egypt. In January 2011, a popular protest began against the Mubarak government, the objective of the protest was for the removal of Mubarak from power. Hosni Mubarak ruled the country since 14 October 1981. The former Egyptian politician and military commander was ousted after 18 days of demonstrations during the what is today known as the 2011 Egyptian revolution. Terrain: mostly Desert, except the Nile valley and delta. Literacy--total adult: 55.2%, male: 66.6%, female: 43.6%. Natural resources: Petroleum, natural gas, iron ore, phosphates, manganese, limestone, gypsum, talc, asbestos, lead, zinc. Agriculture products: Cotton, rice, corn, wheat, beans, fruits, vegetables; cattle, water buffalo, sheep, goats. Industries: Textiles, food processing, tourism, chemicals, hydrocarbons, construction, cement, metals. Some of the Government websites are still down or under reconstruction. Official website of the Cabinet of Ministers of the Arab Republic of Egypt. Embassy of Egypt in the U.S., Washington D.C. Addresses of Egypt's Missions abroad. Addresses of foreign diplomatic representations in Egypt. Map shows the governorates of Egypt. Searchable map/satellite view of Egypt. Searchable map/satellite view of Egypt's capital city. Searchable map/satellite view of Egypt's second largest city Alexandria. Satellite view of the Pyramids. Satellite view/map of Irrigation in the Sahara in South Egypt. Map of South Western Asia and the Middle East. According to BBC, Egypt is a major regional media player. Its press is one of the most influential and widely-read in the region, and its TV and film industry supplies much of the Arab-speaking world with shows from its Media Production City - MPC an information and media complex located near Cairo. Former President Hosni Mubarak's departure in early 2011 precipitated an editorial u-turn among state media outlets that had served for decades as government mouthpieces. Today, the Egypt state is a major force in the media and runs many TV and radio stations, websites, newspapers and magazines. But most pro-Islamist media have been closed, or broadcast now from abroad. State run news service in major languages. English language weekly online edition. Home of several Arabic Newspapers. Major Egyptian privately owned daily newspaper. English-language national and international news. English version of Al-Misri al-Yawm. Egypt monthly magazine covers politics, society, culture, travel, and environment. The online edition of the Egypt based magazine. Egyptian publicly-funded news agency, but its service is only for subscribers. The public broadcaster of Egypt. ERTU operates domestic and satellite networks, including Nile TV International and Nile TV thematic channels, it is operated by the Egyptian government. A private satellite network, operates two channels: Dream 1 targeting young viewers and Dream 2, an entertainment channel. The private channel covers current events and has a particular focus on Egyptian topics. ERTU operates eight national networks and external services Radio Cairo and Voice of the Arabs. The revival of the Ancient Library of Alexandria, dedicated to be a center of culture, science and academic research. Collections of Egyptian artifacts, established in 1835. Information about Museums in Egypt by Tour Egypt. NBE is the oldest commercial bank in Egypt. The union of two exchanges, the Cairo and Alexandria Stock Exchanges. The market for growing medium and small companies. Egyptian capital market stock quotes and market watch. EEA is a nonprofit organization founded by the Egyptian private sector exporters. Egypt Yellow Pages is the official publisher of Yellow Pages in Egypt. Egyptian low-cost carrier based at Borg El Arab Airport in Alexandria. The national flag carrier airline. The national railway of Egypt. Feluccas on the Nile near Luxor. Despite the availability of motorboats and ferries, feluccas, the traditional sailboats of Egypt, are still in active use as a means of transport. Discover Egypt: Giza pyramid complex and Great Sphinx, rather old and rather impressive ancient Egyptian style burial site. Luxor's Karnak Temple and the Valley of the Kings, another testimony of the amazing Egyptian death cult at Luxor. 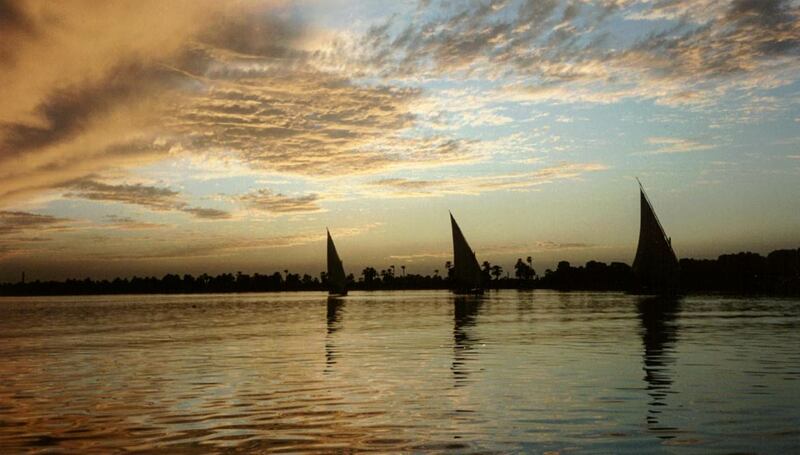 Nile River, Egypts lifeline. 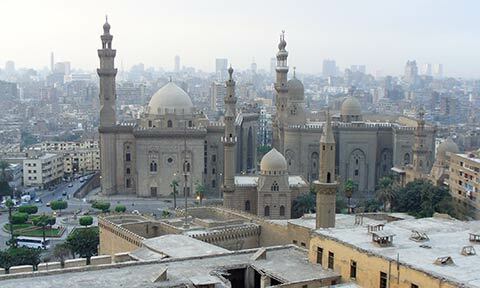 Cairo, capital city and cultural and political center of the country, offers museums, monuments, mosques, and madrassas. Abydos, one of the oldest cities of ancient Egypt, and the site of many ancient temples. Abu Simbel, two huge, old rock temples dedicated to Pharaoh Ramesses II. Red Sea, with tourist resorts at Hurghada, on Egypt’s mainland, Sharm el-Sheikh, and Dahab on the Sinai peninsula. Saqqara, ancient burial ground with a step pyramid. Siwa Oasis, isolated settlement near the Libyan border, with the ruins of an oracle of Ammon. 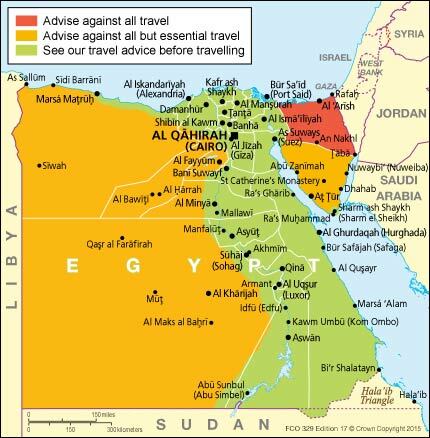 Map of regions in Egypt where travel is relatively safe and where not so. Official site for the Government Tourist Offices in the Americas. An Egypt guide with over 15,000 pages of information about every aspect of travel, ancient and modern Egypt. Abu Mena in the Mariut desert, was an early Christian pilgrimage center built over the tomb of the martyr Menas of Alexandria. Thebes (today Luxor), the city of the god Amon, was the capital of Egypt during the period of the Middle and New Kingdoms. One of the world's oldest Islamic cities founded in the 10th century. Capital of the Old Kingdom of Egypt and one of the Seven Wonders of the World. Contains the relocated monuments of the two Temples of Ramses II at Abu Simbel and the Sanctuary of Isis at Philae. The Orthodox Monastery of St Catherine at the foot of Mount Horeb where Moses received the Tablets of the Law. The third Egyptian University, founded in 1950. Chief center of Islamic and Arabic learning in the world, founded in 970. Giza, largest university in the Middle East, founded in 1908, it is the oldest university in Africa. The website of the library (by now only in Arabic). Official website of the Ministry for Environmental Affairs. A.P.E. works with the informal garbage collectors of Cairo known as the Zabbaleen. The center acts as a catalyst, facilitating collaborative action between the Arab Region, Europe and the International Community in the fields of environment and development. The center provides organic and biodynamic training and consultation, it is recognized by the European Union, international Demeter Organization and GLOBALGAP as an inspection body operating in a third country. A "sustainable development" and "industrial ecology" demonstration and training center. Cairo's recollections online - Egypt's first website and a journey into bygone days of Egypt. From Ancient to Modern History of Egypt by Egypt TourismNet. Representation of Isis goddess in the Philae Temple in Aswan. The project puts all the Egyptian archeological sites on a multimedia geographic information system to document the Egyptian archeological heritage. Index of resources for the study of ancient Egypt, Oriental Institute, University of Chicago. The British Museum's web site on ancient Egypt, includes information on Egyptian life, gods and goddesses, mummification, rulers, pyramids, temples, time, trade, and writing. A UK based site dedicated to the culture, language, religion and history of Ancient Egypt. The history, language and culture of Ancient Egypt by Egyptologist Jacques Kinnaer. Site about five thousand years of Egyptian civilization, view artifacts, interactive maps and timelines. A modern journal of Ancient Egypt.